Will the real Warriors please stand up? We should not be surprised by the Golden State Warriors’ March swoon, not after last year ended with almost everyone in the organization conceding that the regular season can be a comedown when you’ve injected so many playoff highs into your veins and especially not after this year began with contempt bred by that familiarity. After all, a decisive victory against the upstart Denver Nuggets on Friday set some distance between the Warriors and the rest of the West for the conference’s No. 1 seed, and the two-time defending champions are still heavy favorites to three-peat. Yet, Sunday’s loss to the bottom-feeding Phoenix Suns may have marked Golden State’s worst loss of the season, two games after the team set its previous low standard in a 33-point loss to the then-reeling Boston Celtics, and with it came a handful of storylines that suggest these Warriors may be as vulnerable as ever. The final 6:38 against the Suns and the resulting media sessions revealed several more hurdles the Warriors will have to clear in order to hit the ground running in the playoffs. The unraveling began when Kevin Durant rolled his ankle on DeAndre Ayton’s foot, resulting in a contusion that cost the impending free agent the rest of the game. It was dubbed not-so-serious by Warriors coach Steve Kerr afterward. Of greater concern was the emotional bruise that this game inflicted on them. Or, as Durant so eloquently put it on his way into the tunnel, via a KNBR cameraman, “Stupid a— motherf—ing game we playing. We need to be playing championship-level basketball.” Naturally, Durant did not meet with the media after the loss. Green was, of course, spending a break in the action complaining to referees. Kerr’s comments did not work their way into the Twitter stream until after his postgame press conference, and the coach declined to discuss it when he entered the locker room looking for Green, presumably to apologize, per The Athletic’s Anthony Slater. Like Durant, Green had already left without speaking to the media. Kerr and Green had a notorious dustup in February 2016 that threatened the fabric of a dynasty before strengthening the coach-player bond. If lips were read correctly, as banal as Kerr’s comments may have been this time around (he is far from the only one tired of Green’s act), this will no doubt be the subject of another sitdown between the two sides. How Green responds now may be more serious than Durant’s ankle injury, and the organization’s decision to suspend Green for conduct detrimental to the team earlier this season may make making amends more difficult. And while Kerr was seeking out Green, Warriors guard Klay Thompson was calling out the home crowd in his postgame media availability, accusing the fans of approaching this season with the same laissez faire attitude as his teammates. Thompson has as much cache with Warriors fans as almost anyone, so this is less likely to generate a ripple effect that somehow makes Oracle a less intimidating playoff environment, but it does speak to the team’s frustration level and lack of drive that its most even-keeled member is calling on the crowd for motivation. By now, you are surely well aware of the rising temperatures inside Golden State’s locker room. Another profanity-laced argument between Green and Durant brought that to the forefront in November, and the impetus of that debate — Durant’s potential departure in July — has simmered underneath the surface all season. It has boiled over during this recent rough stretch, which includes a 4-6 record in the team’s last 10 games. There was Durant’s odd outburst after The Athletic’s Ethan Strauss reported a growing concern that a disconnect between the superstar and the superteam is rife with signs that he is headed elsewhere at season’s end. After weeks spent wondering if the Warriors would find the joy that once made them so special, Kerr sought more “anger” in the wake of last week’s Boston rout, which led Durant to question whether his coach was eliciting the proper emotions. 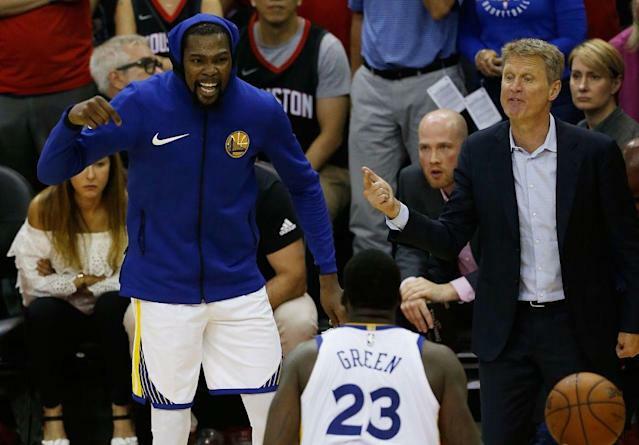 The friction still seems to spark most when Green and Durant are rubbed the wrong way, and when Kerr is trying to keep them from setting an all-time team aflame. Where once there was West to mediate these matters, there is now an injection of DeMarcus Cousins to an already volatile mix. His return from injury at first seemed to inspire confidence that Golden State would establish its dominance once again, but he has since further complicated chemistry beyond his own on-court demeanor. His inability to shoot from distance (23.3 percent on 3.2 3-point attempts per game) has done little to offset his plodding nature (he’s the league’s sixth-slowest regular, per Synergy), all of which defies what made the Warriors so dangerous — those pace-and-space-induced scoring barrages that erased deficits in mere minutes. The misplaced fit might be more glaring on defense, where Cousins was routinely spun into pick-and-roll mismatches to the delight of an array of Celtics ballhandlers. Depth is an issue everywhere on the roster, but it is most glaring in the middle. Behind Cousins, the Warriors rely on a hodgepodge of less threatening bigs, all of whom have made for a weak link in the chain of command. This might be why they turned back to Andrew Bogut, who will do little to alleviate these same concerns. The playoffs might remove any and all drama. The Warriors are talented enough to win despite the physical and emotional toll of a fifth straight race to the Finals with a roster full of locker roommates who may not want to live together much longer. The latest iteration of the death lineup — with Green at center, Andre Iguodala in tow and three of the greatest shooters in NBA history around them — is still outscoring opponents by an outrageous 26.8 points per 100 possessions, per Cleaning the Glass, and that could render any concerns about Cousins moot. This might just be a matter of the Warriors treating March like an exhibition, much like they did last year, when they similarly nursed injuries and egos. If ever there were a team that can flip the switch, it is one full of All-Stars who understand the legacies on the line. As Stephen Curry told reporters after Sunday’s loss, “Let's not forget last year. It was way worse than this.” And we all know how that turned out. Wednesday’s game against a Houston Rockets team that is increasingly looking like Golden State’s greatest threat in the West again may be a window into the real Warriors. Their response will either further these many concerns or reinforce the idea that all of this is much ado about nothing until proven otherwise in the playoffs.